I can read the words and I can study the picture…. the cows have come home and I cannot see break blocks on the stock (even though there is a decent suggestion of fulcrum levers and yokes underneath the van). Wheels look interesting, break van appears to have spoked wheels at the nearest end, not so sure about the further end. Other coaches appear to have “solid” wheels. And just in case Mike comes by – “brake”! The brake blocks on the Stroudley carriages were tiny little things – if you click the image you can just see them on the nearest brake third. LBSC brake thirds did indeed have spoked wheels – both the nearest and furthest carriages are examples. The middle carriage looks to me like a 1st/2nd composite, and has Mansell wheels. Click and all is revealed, even to the types of wheels – thank you. Where are those Brighton experts? Stroudley was a leading light in the Newark brake trials of 1875, I suspect because he had already been promoting George Westinghouse and all his works. Maybe there’s more to this than was ever put in writing. We know that discussing painting, colour schemes and finishes can open up an inconclusive saga; but I do wonder why so many railways painted carriage roofs white when it was the area most susceptible to blackening from smoke and the atmosphere generally. They must have deteriorated quickly via a streaky tan to a mucky brown/grey. Vermilion brake-van ends? I’ve read that this was nearer a “red-lead” colour, though marine type protection wasn’t implied, just (again) the vermilion quickly going off-colour. Brakes and breaks? I keep thinking that I saw a drawing some years back shewing a brake van and using the word “break” officially, as it were. Of course, I can’t find it now so I can’t remember the detail. In any case, spelling wasn’t considered so very important until about the 1850s, providing everyone understood what one meant. The LBSC guard still has his broad-buckled sabretache, though they must have started to die out around that time. Are three door headers painted to indicate first class? – a progenitor of “Jazz” markings? Are three door headers painted to indicate first class? Ooohh, I do like a nice puzzle at this time of year. The idea of painting the cantrail to indicate class difference has much to commend and support the concept…. except Adrian describes just one type of break and that is a “brake third”. So, if the colour marking indicates a class distinction then there needs to be a re-think on the types of Stroudley four-wheel stock. Thought – what might the Bluebell C&W team have to offer to this discussion? Lead white was cheap – somewhere I once saw the breakdown of costs for contemporary paints and it made a lot of financial sense to use it. The white turned grey very quickly, not just because off the soot and grime depositing on top, but because of the chemical reaction between the sulphurous exhaust and the lead. Curly Lawrence mentions in his autobiography that engine cleaners repainted the white roofs of the locos frequently – I’ve no doubt that carriage cleaners did the same. As an aside, Philip Millard has mentioned on more than on occasion that LNW carriage roofs almost always look pristine white, even in non-official ‘in service’ photos. Vermilion ends – I’d be interested to hear more of where the red lead quote came from – the only references I’ve turned up mention vermilion, but the more info the better. Red paint is not very colourfast, even now, and paint technology in the 1890s was pretty poor. I wouldn’t be surprised if it faded to quite a pinkish colour quite quickly. SER goods brake vans had the legend ‘Break’ on new builds in the 1890s, but by the end of the Edwardian era had substituted ‘Brake’. Many companies continued to use the archaic spelling in official documents such as the WTT Appendices for many years afterwards. The LBSC Composites’ four compartments were laid out Second, First, First, Second, and the door headers identify smoking compartments – there are corresponding glass etchings on the quarter-lights. Curly Lawrence? The same”Curly” who wrote for the Model Engineer under the LBSC nom-de-plume? Not just the SER…, the NSR wrote their vans with “Break” rather than “Brake”. Yep, it’s the same ‘Curly’; he began his working life as a cleaner at New Cross in the 1890s and progressed to a passed fireman by the time he left the employ of the Brighton in about 1904, and Oakwood publishes his autobiography. Klaus Marx, who knew Curly in the ’60s, collated his writings and has penned the forward to the book. Klaus is the Editor of the Brighton Circle’s journal, and has been a useful contact (it was he who ascertained for me the formation of the train Cheam was hauling in the accident on 7 August 1897), and is at present part way through publishing a very useful historical piece on the ELR from the LBSC perspective in that journal. I know very little about the stock of the North Staffs – it’s somewhat off the radar in East London – so thanks for that. Many thanks, chaps, for all that further information. Unfortunately my filing system, though very secure, is not readily accessible. (Translation: I know I’ve put it safely away …. somewhere.) So I haven’t got a ready to hand reference concerning red lead. This may well be in old (from 1960s onwards) HMRS magazines, and was probably a suggestion as to how to assess the typical, in service shade of faded vermilion. Thanks for that. I’ll liaise with the information co-ordinators of the Brighton Circle before tackling any LBSC stock decoration just to fill in any gaps, and to see what the current interpretation of available information is. Interesting and useful article. May I ask, however, where did you find information about the capacity of the old Craven 4-wheelers from the 1860s? Were these first class carriages? Six per compartment is three per side, which is very low density instead; eight per compartment is four a side, which is not much higher in density. 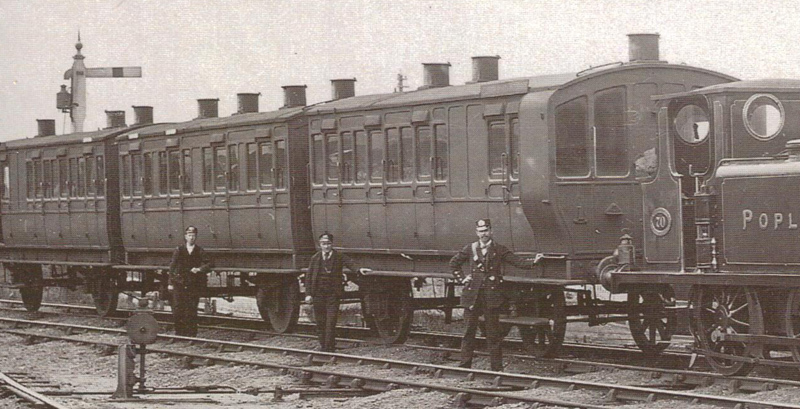 I thought that five a side was standard for thirds, and that some railways in the later Victorian period even got up to six a side, producing (rather cramped) twelve person compartments. Any light that could be shed on the capacities of 1850s, 1860s and 1870s long distance and suburban 4-wheelers would be most welcome! The information regarding compartment capacities was found on p.6 of P.J. Newbury’s Carriage Stock of the LB&SCR (Oakwood Press, 1976). Re-reading it you’re absolutely right – these were first class carriages. I need to go back, recheck the facts and make revisions to this post. Thank you – that is most helpful. Could you be so kind as to let me know when you do find third class information? It will assist me in what might loosely be called a very different kind of railway modelling: I contribute to the open source computer game Simutrans, and find your ‘blog a very useful resource for suorce information about various things, including the London & Brighton carriages. I am particularly interested to know, if your sources stretch to it, when six a side compartments first began to emerge on suburban stock, as well as the before and after third class capacities of Craven’s suburban alterations that you discuss here. I have to be honest and say that my resources for the LBSC are somewhat confined to information pertinent to ELR services in the 1890s-1900s for the simple reason that too broad a base of material would be a distraction too great to ignore! With so many other companies requiring research for this project, I try to keep source material as relevant as I can. However, if anything that answers your questions does come my way I’ll post it on here.